The appearance of a breadfruit can be quite deceiving as well as intriguing. It is, indeed, very different from the usual run-of-the-mill fruits which form a part of our daily diet. Breadfruit appears as well as feels more like a loaf of bread rather than a fruit, as suggested by its name. A ripened breadfruit takes on a softer feel, with its inner flesh adapting a light creamy color, sweet taste, and heavenly smell, making it absolutely irresistible. This fruit grows in tropical climate and is found in select regions of Southern India and Central America. Highly rich in carbohydrates, dietary fiber, minerals and vitamins, a breadfruit makes for an amazing inclusion in the diet, thanks to its numerous nourishing advantages. To know more about breadfruit and its health benefits, continue browsing the following lines. The earliest information about the origin of breadfruit, as part of the human diet, can be traced back to Polynesia, where it was the staple food of the locals. Later, Javanese traders naturalized it on the islands of Malaysia and Indonesia. The expansion of its cultivation began after Sir Joseph Banks and his companions noticed breadfruit’s cheap production cost and stomach filling qualities, while stationed in Tahiti as part of an explorative expedition under the command of Captain James Cook, in 1769. 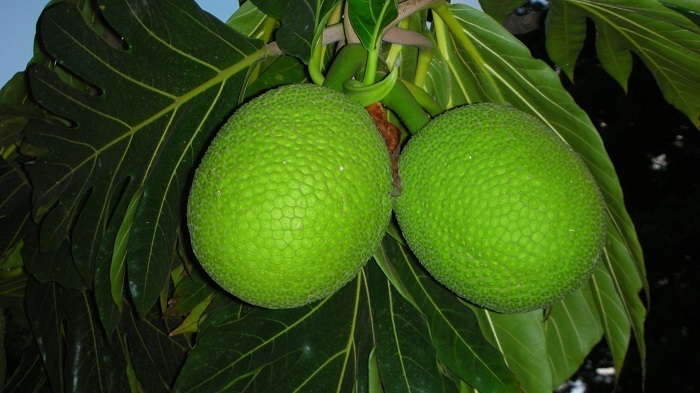 In the 18th century, the breadfruit came to be seen as the solution of the British colonists quest to procure cheap yet high energy sources of food to fill the bellies of their slaves. Thus, in order to introduce this plant to the Caribbean, The Royal Society declared a cash bounty and gold medal for the person or team, who successfully undertakes and completes this endeavor.As a result, in 1787, this voyage to the South Pacific was flagged off under the leadership of the Captain of the HMS Bounty. The expedition was accompanied by a gardener appointed by Banks himself and was armed with detailed knowledge about the upkeep of breadfruit plants. The bounty reached Tahiti and stayed anchored for around five months. During this time, more than 1000 plants were readied for the return journey. However, due to the crew’s mutiny on the journey back, the endeavor remained unsuccessful. Captain Bligh, not losing hope, once again, in 1791, took charge of the second expedition and achieved success. The breadfruit plants were harnessed from Tahiti to St. Helena and later distributed to St. Vincent and Jamaica in the West Indies. Bligh was given the Royal Society medal for his services. However, fearing the unknown, the slaves rejected the idea of eating breadfruit entirely. Breadfruit is well known for its energy boosting tendencies. Its high fiber content plays a pivotal role in lessening cholesterol and triglycerides levels, which are believed to be the root cause of numerous heart-related health issues. It has also been discovered that breadfruit has the inclination to control harmful cholesterol (LDL) in the body and increase good cholesterol (HDL) level, thereby limiting the chances of heart attack. The fiber-rich breadfruit has been found helpful in assisting diabetics, since it reduces the process of extraction of glucose from the consumed food items. Thus, it helps in controlling sugar levels in the body. Another benefit of consuming breadfruit is that it has high fiber content, which helps in cleansing the intestine and inducing regular bowl movement. Thus, as per the studies, it reduces the chances of developing colon cancer. Breadfruit is a rich source of fatty acids, like omega-3 and omega-6. These substances play a significant role in the steady as well as natural growth of body and mind. 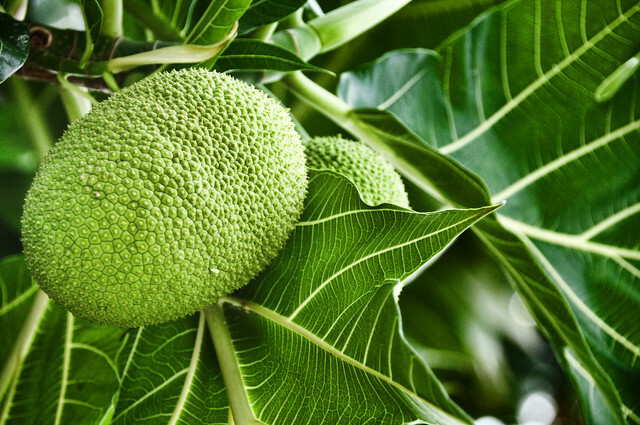 The fatty acids present in the breadfruit are known to have various positive effects on the skin and hair. They assist in building a healthy metabolism, promoting bone growth, and enhancing the reproductive system. This fruit is a generous source of vitamin C, thiamin, riboflavin, niacin, iron and phosphorous. All in all, it provides all healthy and essential nutrients to the body. The breadfruit, like most of the tropical varieties of fruits, is available between the months of May and September. However, some of its types can be found in the market throughout the year. While shopping for breadfruit, you should keep in mind that, though harvested well mature, these fruits are usually not absolutely ripe when they reach the market. Breadfruits are available in various shapes, sizes and colors. Based on your preference, you can choose from the seedless and seeded varieties. As the fruit begins to ripen, its color transgresses from vivid green to light brownish shade. The ripened breadfruit is best to be used as a vegetable in various recipes, since it has sweet-sour custard apple-like taste and gives out fragrance of freshly baked sourdough bread. Once bought, the breadfruit should be kept at cool and well-ventilated room temperature. It turns ripe within 2-3 days if left unused, just like a jackfruit. When the fruit yields to the thumb pressure, consider it absolutely ripened. If it is not consumed right away, it will decay quickly. This fruit cannot be stored in the refrigerator as it cannot tolerate temperatures below 12°F. Despite this, the natives of the Pacific have devised some unique and ancient ways to preserve this fruit, during off-season. They dry off the fruit using various means, such as drying it in the sun and powdering or fermenting it, in the underground ovens.